HAVE you seen this lunatic on the roads? And, according to police, he isn't the only motorist driving at dangerous speeds and dangerously evading officers. Traffic Branch officer-in-charge Sergeant Marty Arnold said while motorcycles only made up 5% of vehicles on the region's roads, they were responsible for more than 50% of evade police offences. "The photo above is of a rider and bike who has been involved in several incidents where he has failed to stop for police after being recorded on several occasions by police radar at speeds of up to 160km/h in a 60km/h zone," Sgt Arnold said. "It's only a matter of time before this lunatic kills himself or some other poor innocent person he hits at an intersection." Sgt Arnold said police were seeking the assistance of the public to identify the rider, who is suspected of living at Moore Park Beach and working on the south side of Bundaberg after being spotted on a number of occasions on both Moore Park Beach and Clayton Rds. "While we are confident we will track down this rider in the near future any help from the public to get this lunatic off the road would be appreciated," he said. Sgt Arnold said some motorcyclists thought because they have more power and pick-up in their engines, they believed they could get away from vehicles more effectively. He said police were only able to give chase based on an assessment of the conditions and environment. "In town, where there are civilians and pedestrians at risk, most intercepts are called off unless the offence is very serious," he said. Sgt Arnold said a lot of the evade offences were happening on main arterial roads where there were pedestrians and school children. 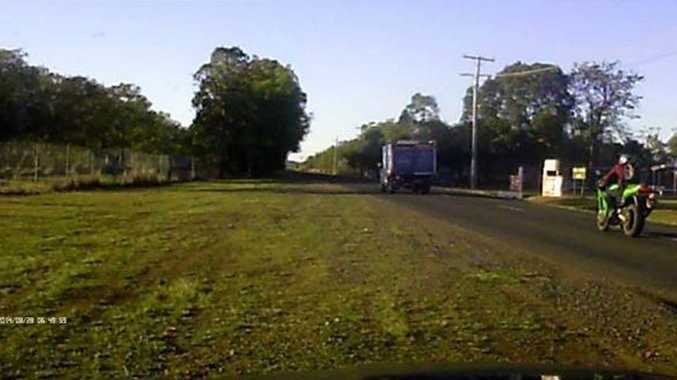 "Police would also like to warn motorists that attempting to evade police interception is a serious offence and has penalties including a $5000 fine and license disqualification for indefinite periods and, under certain conditions, a term of imprisonment," he said. "While there are a lot of responsible motorcycle riders out there unfortunately they are over-represented in both offences and traffic crashes compared with their small numbers." The warning to motorcyclists also comes after four riders have died on the region's roads this year alone. Anyone with information on the identity of the pictured rider is urged to call Crime Stoppers on 1800 333 000 or Police on 4153 9111.